On my Twitter feed today I saw this Tweet. This is a data resource for the entire USA. You can look at it from the state level, or from the city level. Zoom in and create a focus on specific places. Below is an example of the type of data that is available for specific locations, in this case, Chicago. I'm not sure if this data gets more detailed, showing pockets of wealth and poverty within big cities like Chicago. That would be useful. The next image show ProsperityNow networks across the country, and identifies leaders in each city. Since the hastag #ProsperityNowScorecard was used, I hope in future weeks that I'll be able to see how people from within specific places are connecting with each other, and how people from different places are connecting and sharing ideas. 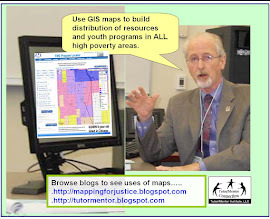 If you've read past articles on this blog, or the Tutor/Mentor blog, you will see my long term commitment to help build and sustain non-school youth tutor/mentor programs which connect k-12 kids to people who live beyond poverty areas and can open doors to opportunities. Thus, my goals and those of ProsperityNow align. Let's find ways to connect and get more people involved.